Along the old DL&W rail corridor, a ribbon of green runs from the Buffalo River across from Solar City to the DL&W Terminal in downtown Buffalo near Canalside. This land, which extends for a mile and a half through The Valley, The First Ward and the Perry neighborhood, is owned by the Niagara Frontier Transportation Authority (NFTA). These days the only thing that runs along the unused rail lines are deer, trees and wildflowers. Several cities around the country are renovating unused railroad infrastructure like this to create innovative and iconic trails and parks, including Manhattan’s High Line, Detroit’s Dequindre Cut and Chicago’s 606. These projects have become beloved, and in some cases world-famous features of those cities. The DL&W Corridor poses a once-in-a-lifetime opportunity to do the same in Buffalo. The DL&W corridor runs through backyards, businesses and parks. Its surrounding neighborhoods are historic and very close-knit. Although the area is experiencing revitalization, there is still a need for greenspace and outdoor recreation. 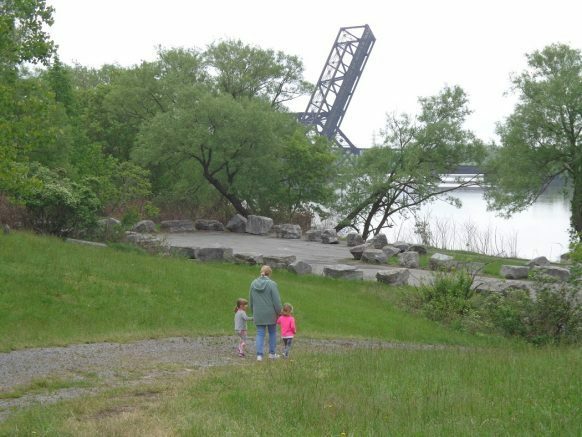 In addition to being a place where people can walk or ride a bike, a new trail and linear park could spur revitalization in the surrounding neighborhood and the entire region, building on investments at Canalside, the Outer Harbor and Riverbend. As a healthy urban greenspace, it could also provide important ecosystem services like wildlife habitat and stormwater retention, ensuring that the rail-trail is beautiful, engaging and ecologically resilient. Portions of the corridor adjacent to the DL&W Terminal, the current terminus of the NFTA Metro Rail, could accommodate potential future light rail expansion. After completion of the community vision plan, the next step will be a high-profile design competition. M&T Bank is sponsoring the competition and has contributed $50,000 as a challenge gift toward the project. The Land Conservancy must raise at least an additional $100,000 by the end of May 2018 to match the challenge gift and make the design competition a reality. Please join this effort and make this project a success by donating to support the DL&W project. Contributions of all amounts are helpful and can be made on the Land Conservancy’s website (www.wnylc.org), or by sending a check made payable to the “Western New York Land Conservancy” to P.O. Box 471, East Aurora, N.Y. 14052. For questions, please contact the Land Conservancy. All donations for the DL&W project are tax-deductible. The Community Foundation for Greater Buffalo, a 501 (C) (3) organization, was established in 1919 to enhance and encourage long-term philanthropy in the Western New York community. The Foundation’s mission is: Connecting people, ideas and resources to improve lives in Western New York. For nearly 100 years, the Community Foundation has made the most of the generosity of individuals, families, foundations and organizations who entrust charitable assets to its care. The Ralph C. Wilson, Jr. Legacy Funds were established at the Community Foundation to provide support to four areas that were important to Mr. Wilson: caregiving, community assets, design and access, and youth sports. Endowment funds, like these created to honor Mr. Wilson, are designed to grow over time and provide funding for charitable causes according to a client’s wishes. For more information, please visit www.cfgb.org. Be the first to comment on "Bringing nature downtown: New life for an old rail corridor"